We see it all the time… boarded up pubs on high streets all around the country. It makes us think nostalgically about pints of ale, vodka and tonics, pub banter, games of darts and dominoes and the shouts of ‘time, gentlemen please’. But pubs of old are becoming a dying breed replaced by gastro pubs and coffee shops. Like our continental friends we are now part of the Café Society. But this is not entirely a modern phenomenon. In 17th and 18th century England coffeehouses were popular with people from all walks of life as places to meet, chat and gossip. The first coffeehouse in England opened in Oxford in 1652 followed by Cornhill in London later that year, by a Greek, Pasqua Roseé. Very soon they became common and whilst the coffee didn’t always taste good it did add a certain buzz. By 1739, there were over 550 coffeehouses in London. However, the new fashion for tea caused a decline in the number of coffee houses. Revived in Victorian times, coffeehouses were set up as alternatives to public houses where the working classes could meet and socialise. Indeed, several great British institutions such as the London Stock exchange can trace their roots back to coffeehouses. However, it wasn’t until the late 20th century that coffeehouses were ‘re-invented’ by companies such as Starbucks, Coffee Republic and Costa Coffee. There are now 21,000 less pubs in the UK than there were in 1980 –The Campaign for Real Ale backs up these findings, with figures showing about 29 premises a week are closing. Our pubs are of course by no means alone in this with shops and banks disappearing fast from our high streets. However, on a more positive note, these traditional establishments are being replaced by coffee shops with the industry showing significant sales growth and a total turnover in the region of £8 billion this year, coming on top of years of considerable growth. The coffee house trade continues to be one of the most successful in the UK economy. We are now a nation of coffee drinkers, with the number of UK coffee shops doubling in the last decade. Over 4,500 pubs closed between 2009 and 2013 in the UK, but in the same period nearly 4,000 coffee shops opened. There are, of course, many reasons for this change in trend, such as the trend for meeting up to have a drink and relax in a coffee shop rather than a pub. There has certainly been a shift in attitude as people look for healthier alternatives by embracing these cultural changes. Other factors of course come into it such as the huge increase in sales of alcohol in supermarkets which has largely been fuelled by the difference in cost between going to the pub and enjoying a drink at home. Coffee shops are evolving and becoming more family friendly by offering a range of products and pastimes for people of all ages including a long list of hot and cold alternatives to coffee along with facilities such as free Wi-Fi making them the perfect place to spend the afternoon. In another interesting development, sales of beer at University unions across the country have also fallen over the last three years, whereas sales of hot drinks are up 11 per cent in the past year. The latest survey of 1,000 undergraduates found that 43 per cent of the students identified café facilities as the most useful service available to them, with only 37 per cent identifying bars. The same survey found that 87 per cent of the students identified coffee shops and cafés as the services they used most, ahead of bars (74 per cent). It is clear that pubs are now following the trend and embracing these changes by investing heavily in their coffee offering. In the May edition of Boughton’s Coffee House Magazine, coffee industry expert John Richardson was asked about his thoughts on pubs getting into coffee and replied “This is a huge part of the market and a fundamental threat to coffee shops because most of the time the pubs can afford to put coffee out cheaper, as it’s extra revenue on top of what they’re already doing. Pubs are getting better at working outside of traditional pub hours and making it a more palatable experience that’s less about the smell of stale beer. Coffee shops can’t afford to rest on their laurels, they have to genuinely offer a better experience”. It is estimated that there are currently 21,000 coffee shop outlets in the UK. If the trend was to continue at the current rate then the number of coffee shops will overtake pubs within ten years. “Coffee in pubs is no longer to be feared as everyone is upping their game, with gastro pubs leading the way. Dusty filter machines lurking in the corner of the bar are being replaced by shiny state of the art machines manned by staff who’ve had proper barista training.” – Sarah Wilson, Editor of Boughton’s Coffee House Magazine. 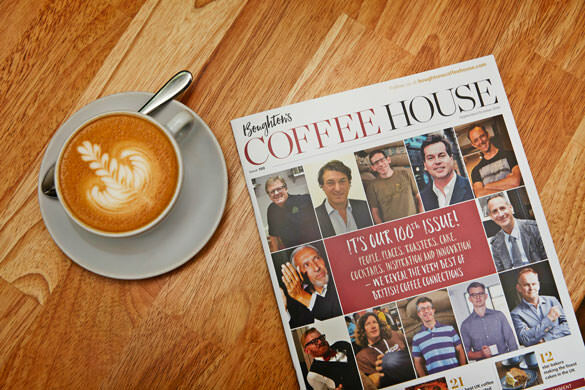 Newhall Publishing’s content has come from our continuous work in ensuring that the Boughton’s Coffee House magazine which we produce 10 times a year features all the up-to-date news from the world of coffee.